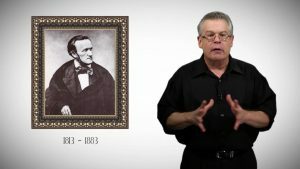 Richard Wagner: What Ever Happened To Wagner’s Manuscripts? The scope of Nazi Germany’s crimes against humanity will forever boggle the mind. Incredibly, almost seventy years after the end of World War II, art and treasure pillaged by Nazi Germany continues to be found even as treasure hunters search for billions of dollars worth of missing gold, platinum, and diamonds. The stories of these treasure hunts read like fictional WWII thrillers by such authors as Len Deighton, Ken Follett and Jack Higgins. But sometimes the clichés hold true and fact is stranger than fiction. Hitler came to power on January 30, 1933 and blew out his diseased brain on April 30, 1945. His projected “Thousand Year Reich” lasted all of 4473 days, 4472 days too long. During the course of those 12 years the Nazis plundered art and treasure from across Europe. As the War entered its terminal phase in 1945, a frantic effort was made to hide the loot from the advancing Allies. The recent movie Monuments Men (2014) tells the story of some of the missing art, but gives no sense of the incredible scope of what was stolen and hidden. According to the United States Holocaust Memorial Museum, the Nazis stole at least 16,000 pieces of art, many of which are still missing. Discoveries, when they happen, can be spectacular. For example, in March 2012 121 framed and 1,258 unframed artworks were discovered in a squalid apartment in Munich. The art – most of it so-called “degenerate art” seized by the Nazis – was in possession of Cornelius Gurlitt, whose father Hildebrand was a Nazi art dealer tasked with disposing of this “degenerate art”. The trove – thought to have been destroyed in bombing raids during the war – included works by Matisse, Chagall, Dix, Daumier, Leon Kirchner, Franz Marc, Delacroix, Canaletto, Max Liebermann and Théodore Rousseau. Valued at over a billion dollars, the monumental task of attempting to identify the rightful owners has begun. Less valuable but more powerful is a 10-acre site in Klandorf, thirty miles north of Berlin. Mined for years by treasure hunters and flea market sellers looking for art objects, porcelain and silverware, the dump was “officially discovered” in 2007 by the Israeli Police detective and “treasure liberator” Yaron Svoray. The dump contains objects looted from Jewish homes, businesses, and synagogues across Germany during Kristallnacht, “the night of broken glass”, which occurred on November 9, 1938. The huge site is largely unexplored and unexcavated, and it remains to be seen what is hidden there. In 2013, this same Yaron Svoray – along with the National Geographic Society – began an underwater search of Lake Stolpsee, a 920-acre lake roughly 50 miles north of Berlin. After the War, eyewitnesses told Allied investigators that in March of 1945, emaciated prisoners from the Ravensbrück concentration camp were forced by SS troops to ferry 18 heavy crates out to the center of the lake and dump them overboard. The SS then shot the prisoners and dumped their bodies into the lake as well. According to some sources, the crates contain nearly half-a-ton of gold and platinum valued at 1.65 billion dollars taken from Jewish inmates at Ravensbrück, though other sources claim that the boxes contain concentration camp files that the Nazis wanted to keep away from the advancing Red Army. Perhaps we’ll find out. And so it goes as the searches go on. Billions of dollars worth of gold are said to lie somewhere on the bottom of Lake Toplitz in Austria. Another billion dollars worth of gold is said to lie deep in a mine somewhere in the Leinawald forest near Leipzig. Hitler’s personal stash of diamonds – which was squirrelled away in order to finance so-called “Werewolf” (guerilla) groups – is believed to be buried somewhere in Mittenwald, in southern Germany. The fabulous Amber Room panels, looted from the Tsarkoye Selo palace outside of St. Petersburg, have been missing since 1945. We would add to the list of missing treasures a large cache of opera manuscripts, handwritten scores of by none-other-than Richard Wagner. For once, these were not stolen but rather were given to Hitler as a gift on April 20, 1939, on the occasion of his fiftieth birthday. Hitler, who adored Wagner, kept the manuscripts close, and they went into the Bunker with him as his Reich went up in flames. What happened to these priceless manuscripts? And by what circuitous route did they end up in Hitler’s hands? To find out, tune in below or directly on Scandalous Overtures.